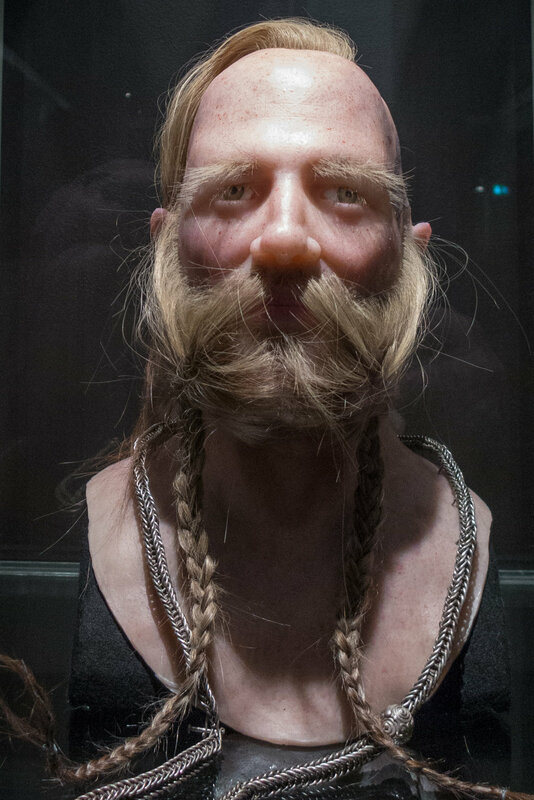 A redesign of the exhibition space at the National Museum in Copenhagen for the display of their collection of Viking artefacts was opened officially yesterday. A first small square gallery has an introduction to this new display with images of three warriors and larger than life images of the king Harold Bluetooth and Tova his queen with the reconstruction of a throne. There are important items from the museum collection but displayed along with rubber portrait heads. 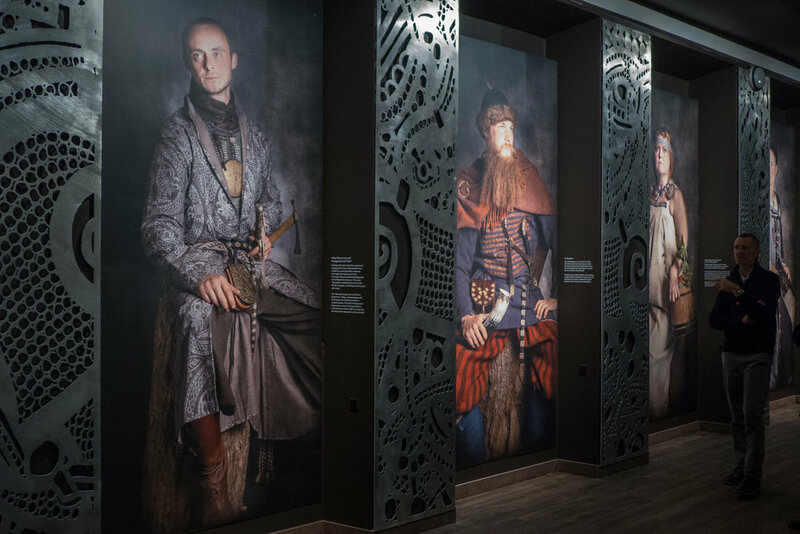 In the main gallery beyond, one long wall has further large figures of characters from the Viking period with a merchant, a housewife and so on and with each given a pen portrait or short back story. My first reaction was that I wasn't sure if I was being introduced to Vikings warriors who were the first competitors from an early version of the Roskilde Festival naked run - but with fancy head gear - or to hipsters who have been living in Vesterbro since 875 AD and to kings and queens who were unbelievably attractive people who had just had a sauna and scrubbed up well before going to the equivalent of a casting session at HBO or Netflix but in the 9th century. But actually, although I'm being sarcastic, I'm not about to launch into an attack although there has been some heated discussions in the press over the last couple of days about how authentic the costumes are or if some artefacts have been shown together when they are not contemporary and much about where on their bodies Viking men had tattoos … or not. These costumes and setting for the reconstructions are by the Danish designer and author Jim Lyngvild although the museum has been quick to emphasise that these are based on current academic reassessments although much has to be speculative because, for instance, fragments' of rich silks brought back from the middle east have been recovered from excavations but few garments. However, on balance, it is a good attempt to make us, the visitor, look again at our view of Viking life and Viking culture and particularly if that view is confined to stories of long ships and warriors wearing horned helmets who headed off on raids to plunder and pillage. The story here draws attention to trade, culture and governance and looks at just how far Danish traders travelled and just how much was brought home from not just Baltic neighbours but through trade and conquest of Northern England; from settlements in Ireland and then south through areas of France and by the Viking traders travelling through the Mediterranean to trade with the Middle East to bring back valuable goods from as far away as Persia. But the exhibition is also careful to point out that the vast majority of the population stayed at home with the wealthy taking care of large estates farmed by peasants and servants. The role of women was more nuanced than we might assume for with men away trading or fighting, aristocratic Viking women may have had a large degree of freedom and power. The exhibition also looks at recent ideas on the role of women in these expeditions abroad. Women would have travelled with the fighting ships to form new settlements and although some may consider the idea of shieldmaidens as a myth, some warrior graves have been identified as female graves. I learnt a lot. For a start Viking men seem to have been fastidious about grooming and in one excavation of grave goods they even found silver ear spoons. I actually looked but IKEA seem to have dropped them from their catalogues sometime since the 10th century. Brooches that were part of a hoard from Hornelund near Varde. The fine filigree work and the form of decoration with vine leaves indicate that they are by Danish goldsmiths and date from the second half of the 10th century. Hoard from Terslev in Zealand with silver weighing nearly 7 kg including an astounding 1,751 coins. Buried in second half of the 10th century. A large bowl may have come from Persia showing the huge stretch of Viking maritime trade. Sword from 800-900 AD found in Søndersø Lake in Northern Jutland. It has elaborate decoration with silver thread and fragments of the scabbard suggest it was not lost in battle but was possibly part of an offering of thanks.